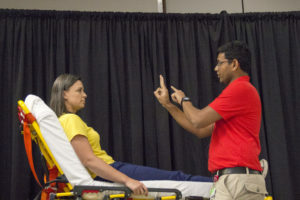 AR SAVES will host our 11th Anniversary Tele-Stroke Conference at the Hot Springs Convention Center in Hot Springs, AR September 24rd-26th, 2019. We received well over 300 nurses, doctors, EMTs and other stroke-care professionals in attendance from across the state during the 2018 AR SAVES Stroke Conference. The goal of this year’s conference is to be an even bigger presence in Arkansas as we continue to increase awareness of stroke and work to provide educational opportunities in the management of stroke and stroke-related disease. Brought to you by the University of Arkansas for Medical Sciences (UAMS) Center for Distance Health (CDH) Neuro Tele-Stroke Program (AR SAVES).